One of my very favorite things to eat are fried clams but rarely do I find them worthy of eating. For one thing, if they are just the strips without the bellies, they are more batter than clam. Only if they are steamers (aka piss clams) so they won't have the right texture variation from plump juicy to crisp chewy. And if the place uses a low grade commercial oil for frying and doesn't change it often enough, the fried clams become all but indigestible. I have found one place in the world that makes fried clams exactly to my taste--The Clam Shack in Kennebunkport Maine (see below for contact info). (Actually this was a discovery of my eating partner in crime Elizabeth Karmel of Grill Friends). I have driven miles to get there from wherever part in Maine I find myself. Sadly and obviously fried clams can't be shipped, but to my delight, The Clam Shack has just started shipping their lobster roll kit! It is shipped overnight in Styrofoam, with icepacks, and despite the 90 degree weather it arrived in perfect condition--the ice still frozen and the lobsters, even the Styrofoam, smelling only of that dreamy briny/sweet sea-breeze aroma. The kit includes one pound of whole lobster tails and claws which I couldn't bear to cut into smaller than 1-inch chunks. Also included are 6 excellent top- split hot dog buns that are baked side-by-side, the better to absorb the butter I brushed on them after pulling them apart and before lightly grilling them. Mayonnaise is also included in the kit but I prefer to make my own lemony version (see recipe below). These lobsters deserve it. Karen and Andrew left at midnight to get ready for a marathon in Central Park which they never ended up running due to being too happy to contemplate getting up at 7 am! I didn't have to run a marathon--I lost 2 pounds lugging boxes all over the apartment! It was well worth it on all counts. 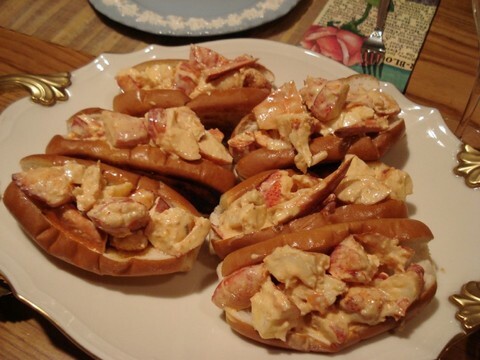 Notes on Composing the Lobster Rolls: You can make the mayo several days ahead and refrigerate it. It's best to do it by hand (with a whisk). Be sure to have all components at room temperature. Don't use more olive oil than called for or it will separate. Shortly before serving or up to two hours ahead and kept chilled, cut the lobster into chunks and toss it with 2/3 cup of the mayo. Pour the remainder into a gravy boat to add at the table. Just before serving, heat a grill or large cast iron griddle or skillet over medium heat. Brush each side of the rolls with melted butter, preferably clarified. (You'll need about 1/3 cup in all) Grill or fry for about 2 minutes per side, just until golden brown, watching carefully so as not to over-brown. Cram as much of the lobster as possible into each roll and serve at once.